Budgets are shrinking and energy costs are rising, but when it comes to building performance, school districts are being held to higher standards. Today, the demand for accountability is stronger than ever. Energy-saving projects help support students and teachers to perform at their highest level by conserving natural resources and delivering bottom line cost savings for the school. 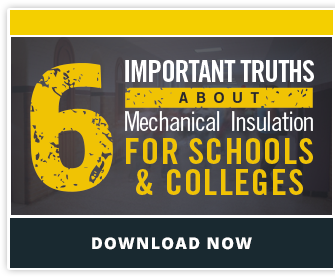 Installing and maintaining mechanical insulation is one small step that can lead to big savings for schools. According to a 2011 study by the National Insulation Association, mechanical insulation saves schools, on average, 13 kBtu/sf/yr of site energy (about 20 percent of the total usage). Even with a relatively low operating time compared to other commercial buildings (five days a week for nine months of the year), this is a significant energy savings. In fact, according to the study, it can be argued that some of the energy distribution systems in commercial buildings could not function without mechanical insulation because distribution losses would become excessive. The table below shows the results of the NIA study: energy savings due to mechanical insulation in schools. That is why it is vital to the optimization of any mechanical system that the insulation is regularly inspected and maintained. Luckily for schools where the time and manpower of the maintenance professionals is of high value, mechanical insulation is generally very low-maintenance. But it does require regular visual inspections and routine upkeep to function the way it was intended. This can be done by a professional insulation contractor, but a low-key insulation maintenance plan can also be implemented by the school’s maintenance professionals. Whether it’s new construction, renovation, or general maintenance, mechanical insulation in schools should be top of mind for school leaders. The energy and cost savings are too significant to give up, and the benefits will help support the overall goals of any school.